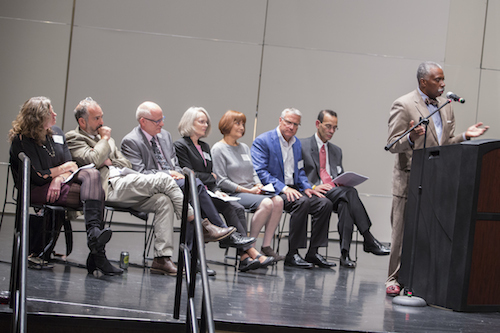 On Friday, Oct. 13, UWM faculty, staff, students, alumni and community members gathered at the Zelazo Center for the Performing Arts to celebrate the national accreditation of the Joseph J. Zilber School of Public Health. 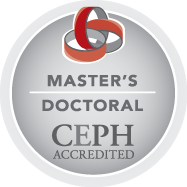 The school learned this past summer that it had attained national accreditation from the Council on Education for Public Health, making it the first accredited school of public health in Wisconsin. During the festivities, remarks were given by Interim Dean Ronald Perez, Provost Johannes Britz, Elise Papke on behalf of founding dean Magda Peck, Susan Lloyd of the Zilber Family Foundation, John Kersey of Zilber Ltd, Bevan Baker of the Milwaukee Health Department and two Zilber faculty members, Associate Professor Amy Harley and Professor Paul Florsheim. The graduate-level Zilber School joins 58 other accredited schools of public health in the United States, a list that includes Harvard, Yale and Johns Hopkins universities. UW-Madison, the Medical College of Wisconsin and UW-La Crosse have nationally accredited public health graduate programs, but not dedicated schools.